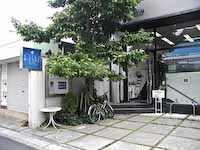 �@Artland Gallery is located at 4 Hama-machi Marugame Kagawa 763-0022 Japan. �@ For the quickest route to the gallery go to the following website. �@ See the long-distance express bus website. �@ West Japan Railway) and get off at Marugame Station. �@Click on to see the details. �@�� The list shown below refer to the required time from each interchange to Artlnd Gallery. �@�@�@�@�@�@�@�@�@�@�@�@�@�@�@�@�@�@�@ �@�@�@�@�@�@�@�@�@Click on to see the detail. 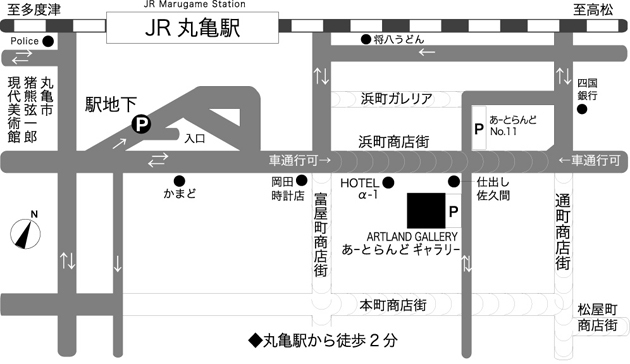 �@Artland Gallery is within two-three minutes walk of JR Marugame station. �@walkers because of a shopping district. See below. 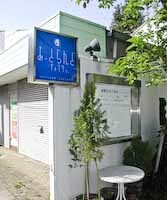 �@Walk to the entrance of Hama-machi shopping arcade in front of the station. �@is on your right. See below. �@the the parking lot entrance. See above. 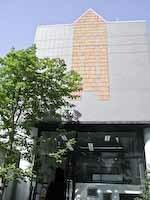 Copyright(C) 2004 ARTLAND Gallery Co.,Ltd All rights reserved.